The January weather in the United States is atrocious. Granted, the slightly chilly 60 some degrees Fahrenheit and rain in the Florida Keys or Southern California sounds pretty good compared to Chicago's forecast of negative one and snow. Either way, a New Year's resolution to eat healthy is hard to keep when the weather is cold and what's really being craved is cozy comfort food. To answer this dilemma I came up with a quick and easy little recipe that is warm and satisfying, as well as a colorful treat for the eyes. If a bit of decadence had to be added to this dish, the Parmesan cream sauce from the post Savory Pumpkin Stuffed Pasta Shells would do the trick! Most of the people I know don't even make New Year's resolutions because they are hard to keep - or perhaps they are just doing life right anyway! But, for what it's worth, click on the for a small article I wrote about how to keep them: "Tips for Keeping Realistic Resolutions." In the meantime, enjoy this spaghetti squash bowl; it is yummy even if it is healthy. A side note - I think grilled shrimp or chicken would be a great addition if some protein was desired. To cook the spaghetti squash cut it down the middle lengthwise. Scoop out the seeds. Fill an oven or microwave safe pan with about 1 inch of water. Put the squash skin side up into the pan. Either bake the squash in a 350 degree oven for 50 minutes or microwave it on high for 20. Squash will feel soft to the touch when it is done. 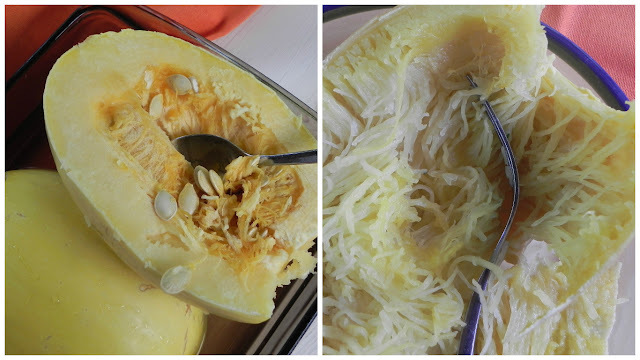 Carefully remove the two halves from the pan, and with a fork "rake" the flesh to loosen the stands of spaghetti squash into a bowl. Set aside. Roasting the tomatoes is nice, but optional. Wash and dry the tomatoes, cut them in half, and place them in an oven safe dish. Drizzle with a little olive oil, and sprinkle them with a bit of salt & pepper. Bake in a 350 degree oven for about 20 minutes or until they are softening but still hold their shape. Set aside. Wash and pat the arugula dry. Arrange the spaghetti squash, tomatoes, arugula, and Parmesan cheese in a large serving bowl or divide and the ingredients among four individual bowls. In a small bowl whisk together oil, lemon juice, salt, and pepper. Drizzle enough of the resulting dressing over the spaghetti squash, tomatoes, arugula, and Parmesan cheese to coat when gently tossed. To serve, sprinkle with additional Parmesan cheese, salt, and pepper. Drizzle with a bit of olive oil. This looks absolutely fantastic! Sounds like the perfect dinner on a cold night. Pinning!